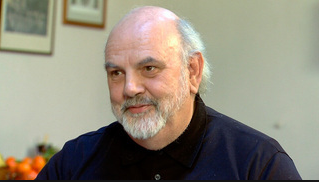 This article from former European Central Bank board member Jürgen Stark (Doomsayers risk a self-fulfilling prophecy) has been occasioning a lot of commentary over the last week or so. 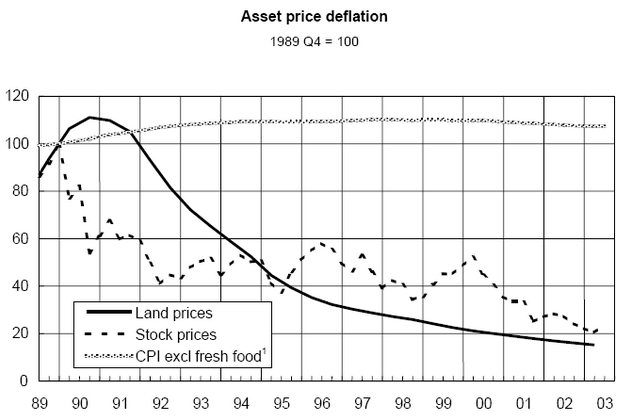 According to Stark, the current deflation debate "lacks three important points: an in-depth analysis of the forces driving inflation down; a clear distinction between “benign disinflation” and “bad deflation”, with a spiral of decreasing prices, wages and output triggered by negative expectations; and a better understanding of the European Central Bank’s approach". "It is likely we are living in an extended period of price stability. This is good news. It boosts real disposable income and will eventually support private consumption. 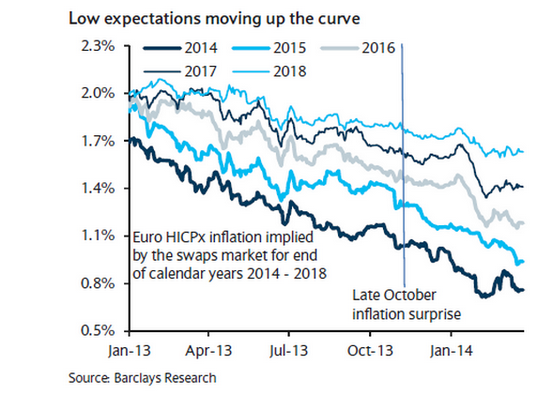 Inflation expectations are well anchored, and there is no evidence households and companies are delaying purchases because of negative expectations. Warnings about outright deflation and calls for ECB action are misguided and irresponsible. 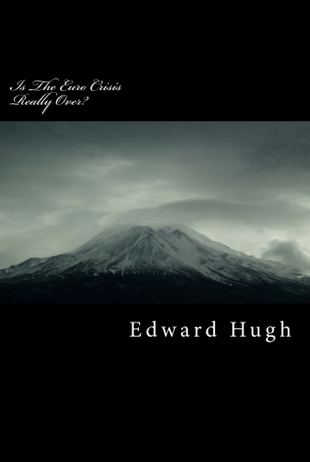 The longer this discussion continues, and the more intense it becomes, the more likely the risk of a self-fulfilling prophecy". 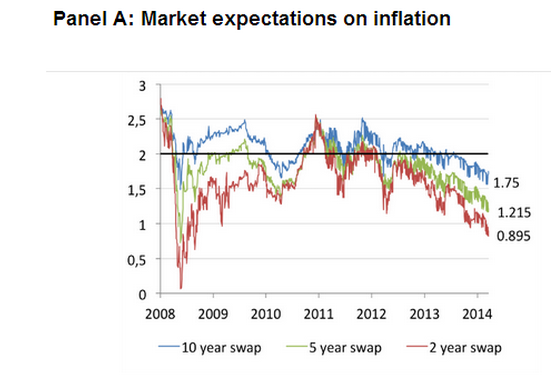 The above chart shows implied inflation expectations as derived from the swaps market. As can be seen expectations have been steadily falling for more than a year now, and they are falling right across the 2014 - 2018 term horizon. 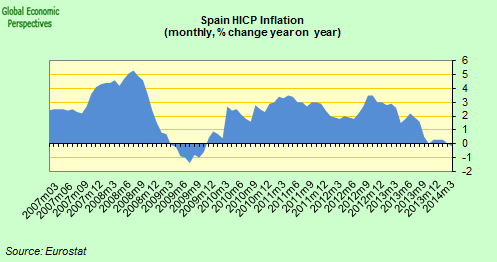 Indeed, as of the time of writing the implied inflation rate is still (at around1.75%) below the ECB 2% inflation objective 10 years from now (see chart below). The second claim I find questionable is that we have NO evidence for purchase postponement decisions. 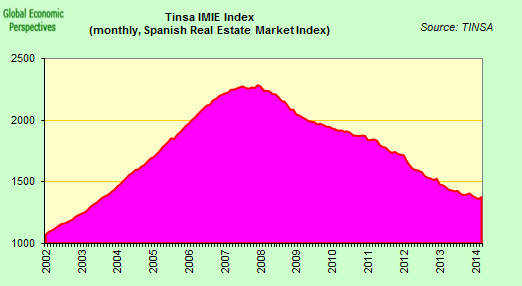 The phenomenon may not be widespread at this point - first of all prices actually have to start to fall - but let's take a look at what has been happening in Spain. House prices have now been falling steadily since the end of 2007 (I use the real estate valuers TINSA index). It's clear that people are delaying purchases in the expectation of lower prices in the future, and they will continue to do so. Why does this matter. Well, let's look at some charts for Japan. 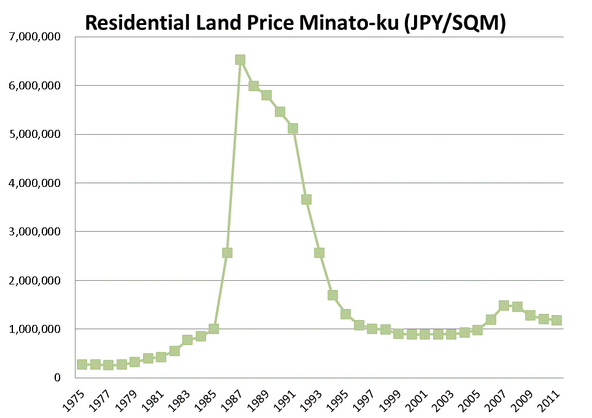 The collapse in land prices was one of the principle underlying elements driving debt deflation in Japan. 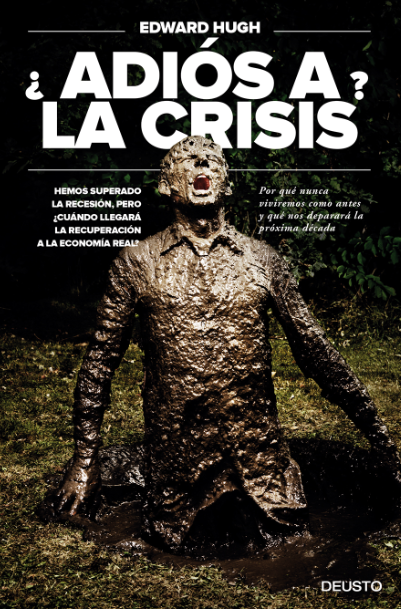 In Spain we don't have a reliable land price index (to my knowledge) but it might be worth bearing in mind that before he left the Bank of Spain former governor Miguel Angel Fernandez Ordoñez jokingly told journalists that "well, we shouldn't expect these assets to have negative value, now should we?" Not sure he continues to have a smile on his face when he talks about this. These land assets may now be largely provisioned for and valued at virtually zero, but there are a lot of them remaining on bank balance sheets and stored in the "bad bank" Sareb, and it isn't clear what the impact would be of releasing them at market value on the price of new homes. (Hint, in many urban areas the land cost was roughly 50% of the final house price before the crisis). 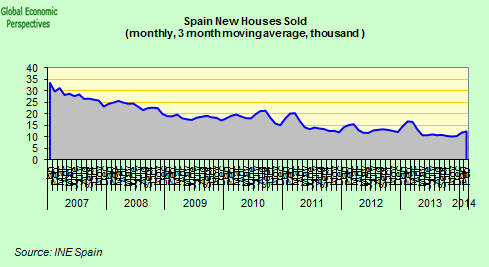 Naturally, the Spanish housing market can be discounted by some as an isolated phenomenon, although I would argue it is important enough to make it very difficult to see the ECB being able to raise rates over any foreseeable time horizon due to the pain this would cause to those with mortgages. But how many other examples like this may there be lurking out there? 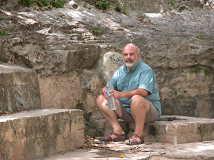 Has Jürgen Stark really run a systematic search, or is he simply repeating - as in the case of well anchored inflation claim - what could be considered to be the official mantra. 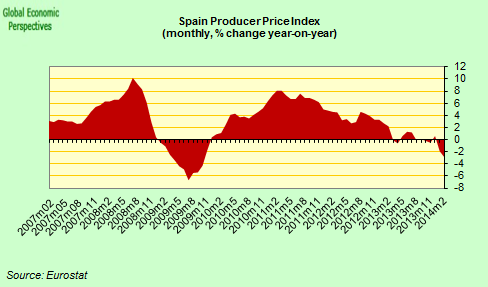 While Spain's factory gate prices dropped an annual 2.9% in February.